This gallery is presented in "blog" style. A large thumbnail is displayed for each image, along with a detailed caption explaining how I intended to express my ideas. If you click on the large thumbnail, you can see it in its full size, as well as leave comments and read the comments of others. I hope you will be able to participate in the dialogue. I welcome your comments, suggestions, ideas, and questions, and will be delighted to respond. A local shopkeeper savors a read and smoke at high noon. This is by far the worst light of the day, offering harsh, unforgiving contrast. But I have two things going for me here: indirect, reflected light off the paper is softly illuminating his face, and the sun is just grazing the end of the top of the end of his cigarette. I use the spot meter to expose for the newspaper, which intensifies the shadow areas instead of graying them out. 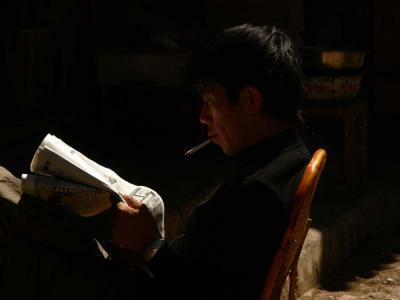 While the fingers, newspaper and chair are strongly lighted, the face and cigarette, which are the most important elements in this image, are subtly illuminated. His black hair and sweater have absorbed much of the light that strikes them, but just enough of his chest and hair show to give his body form. I love lighting challenges. I learn from them, and perhaps others can as well. While walking through this busy Beijing shopping district just after dawn, I noticed an intense reflection of sunlight on the glossy paving stones that lined the curb. Within that reflection was the shadow of a man and his pushcart. I wanted to abstract the man and cart, hold as much detail in the reflection as I could, and still give some context for the busy street around him. I exposed with a spot meter on the reflected sun. The reflection was so intense I knew that I would sacrifice some detail in the street texture. I made this image at 1/400th of second at ISO 80 with the lens closed down as far as it would go. I could have darkened it more with a faster shutter speed, but I would have risked losing background context. Exposure control is a balancing act – there are no right or wrongs here, only an objective to reach. I wanted to hold background detail in the street and I did. The image works for me because it is full of life and vitality, yet also quite abstract and hauntingly beautiful. A bit of burned out street is a small price to pay. I am not after technical perfection in my pictures. I am only concerned with expression. When I shoot, I look not for things to make pictures of, but for the effect of light itself on things. 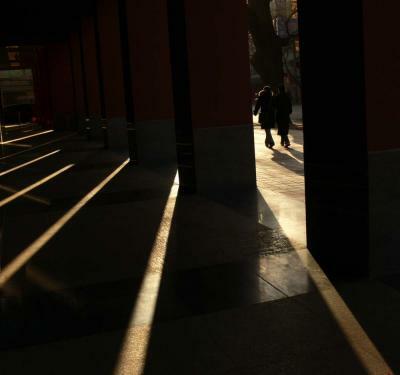 I was drawn to the sidewalk shadows created by a row of columns, and the rhythmic rays of light that fell between them. These repeating diagonal lines could draw the eye into a scene. But what scene was there to draw the eye to? I solved that problem by moving my position until there was more space between the two columns at right than anywhere else in the picture, and then waited for people to pass into and through that space. I was very fortunate – within a few minutes, two people entered that space, walking together, step for step. Their back legs formed rhythmic diagonals that echoed the diagonal play of light and shadow in the foreground. The image became more than just expression of form and rhythm. It expressed a bonding process that makes two people into one – the rhythm of life itself. 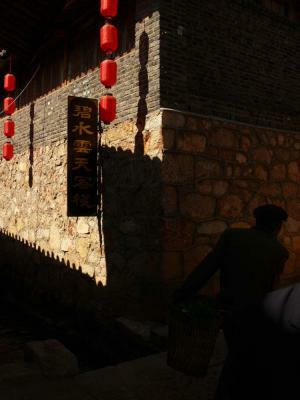 These ancient buildings display strings of lanterns and golden signs -- a tell tale sign that they have been gentrified for touristic purposes. 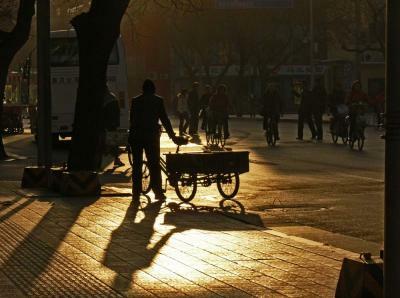 Yet the rhythms of early morning life on the streets of this village are authentic. The shadowy figures at right are farm workers who could well be figures right out of the 1930s. I was drawn to this subject by the play of color, light, and texture on the building, but it was only an exercise in form until the figures hurried past me into the deep shadows at right. Shadows within shadow, they become abstractions that prove timeless symbols. This sign, photographed in the late afternoon shadows at Tom's Welding and Machine Shop in Barstow, California, might have once encouraged travelers along US Route 66 to check their oil levels. Today it offers a nostalgic glimpse of a logo long since discarded. I would not have photographed this sign without these shadows. They hide the face, arm, and a leg, leaving the warm late afternoon light to stress the active leg, chest and one of the arms. The name of the company is also abstracted – this image is about an icon, not a corporation. Even the company’s venerable slogan, “Best in the Long Run,” is obscured by shadow. I want this figure to exist in memory as much as in fact. 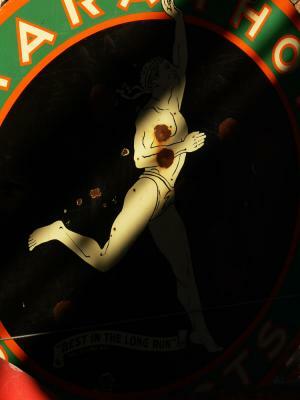 The illuminated partial body, sporting large and small rust spots, says it all. This vehicle wheel hub l has long since come to a stop at Tom's Welding and Machine Shop in Barstow. The golden light warms its rusted finish and with a little imagination, it might seem ready to move once again. I moved in close to abstract it and stress the detail, right down to the tiny figures and symbols etched on the hub. 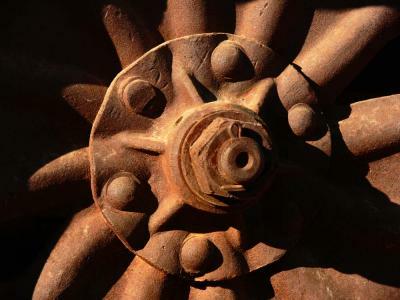 The dark shadows in the background abstract much of the wheel itself, leaving our eyes to feast on the rusty hub with its bolts, nut, and pin, a true relic of the industrial age. Warm light and deep morning shadows mark the start of a new day. What will that day bring? I use the deep shadows blanketing the foreground to suggest that question. The warmth embracing both this woman and the house she is emerging from represents the comfort and security of the known, while heavy shadows signify the mysterious and the unknown. 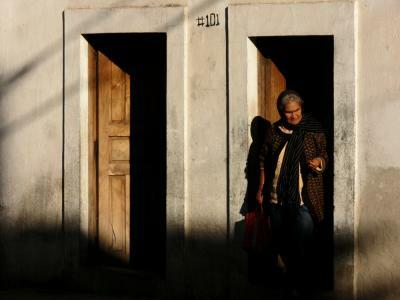 The interplay of light and shadow are working together as symbols for meaning in this image, as are the two doors, which suggest differing options. I intended this image as an expression about the choices we face, the mysteries that await us, and the chances we take. 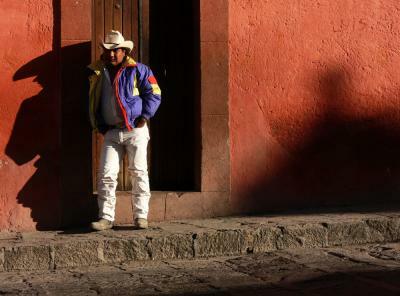 Morning and evening light in San Miguel's clear air and high altitude illuminates the warm colors of its buildings, the colorful clothing of its residents, and casts long and mysterious shadows. I find the man’s sharply defined shadow to be aggressive, perhaps even somewhat threatening. Yet the soft shadow on the right hand side of the image seems more of a mystery than a threat. The man is pinned between both shadows, and framed by the black hole of the doorway behind him. He is so relaxed that he notices none of this. But as photographers, we must notice such things. The meaning of our pictures depends on them. 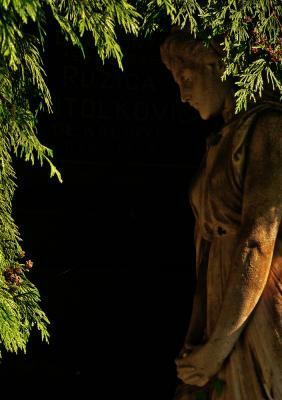 This sculpture, marking the tomb of a 19th century resident of Zagreb, seems to be mourning a loved one. I use light and shadow here to tell the story of grief. There were originally three parts to this image -- the evergreen tree draping the top and left side of the frame, the sculpture behind it, and a tomb in the background. I used my spot meter to expose on the brightest part of the picture – the leaves. The sculpture gets darker as a result -– it seems to grieve even more as it merges into the dark background. The tomb itself vanishes into shadow, creating a large empty space in the center of the image. I use that emptiness to express a loss that cannot be replaced. It is the shadow that best tells the story here. 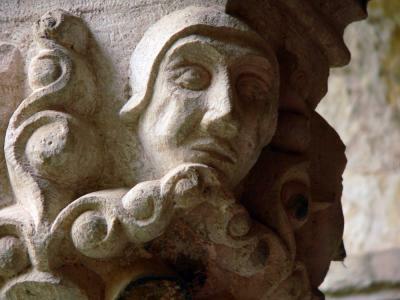 The soft reflected light falling on the face of this figure atop a 14th century sculpted column in the Monastery’s cloister creates a timeless image – it almost comes to life before us. I often think of the flow of light and shadow as sculptural in itself. It reveals as it hides, offering our imaginations food for thought. Some might opt to convert this image to black and white since there is very little color in it. I did not choose to do so. The tiny amount of color here is subtle but important – it is the palette of the middle ages itself, a bit of beige, a trace of purple, wrapped in the softness of gentle, indirect light. It is what gives this image its title. The haunting Mirogoj is one of the most beautiful cemeteries in Europe. Some say Zagreb's former citizens buried here are better housed in death than they ever were in life. The small figure of the child is the focal point of this image. To make it contrast to the overall scene, I spot-metered on its brilliant white marble and everything else in the image falls into the shadows behind it. 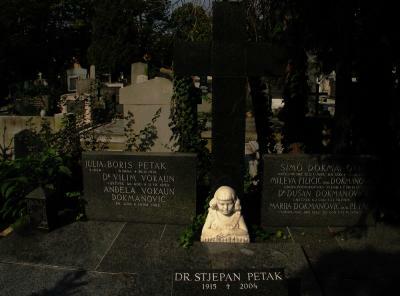 The cemetery itself thereby becomes context for the poignant sculpture of the child. 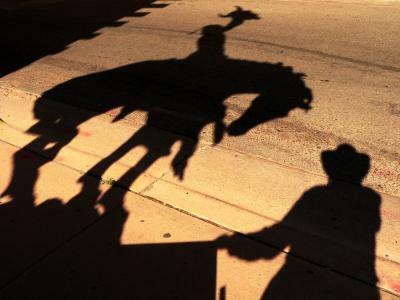 The morning sun was at a perfect angle, throwing a shadow of a heroic sculpture, depicting a mounted Indian holding a buffalo skull over his head, on to the street. As I tried to photograph this shadow, my own shadow kept appearing in the frame. I finally gave up and changed my concept. I would make the problem into my subject matter. I simply held on to the pedestal of the sculpture with one hand and shot with the other. Fortunately, I was wearing a wide brimmed hat, which, in combination with my photographer’s vest, makes me look very much like a figure out of the Old West. The resulting abstraction speaks more of Santa Fe’s history than it does of either the sculpture itself or myself. Both become symbols of a larger idea. Thanks, Jose, for grasping my purpose. I hope these galleries will be helpful to you. I admire your great work but also your capacity to dissect in words as well the inner feelings of a picture as its plain rules. Splendid contribution yours to Pbase. Thanks, Shirley -- yes, the evil eye is quite shocking when shattered by the interplay of light and shadow. I always look for the way light and shadow inform an image. That is what this entire gallery is all about. Thanks for your comment. Your use of shadow can be so powerful, Phil. Love your new entries, especially evil eye. If you have any questions, Janine, please let me know. It would be a pleasure to help you. Dear Phil, I am so pleased I visited your website as I am concentrating my art practice on "shadows". I am even more inspired to continue. Dont you think that increaasing the amount: order + complexity is increasing beauty? Thanks, Offer, for your thoughts on my gallery. I am delighted that my galleries are among your favorites, and I hope you will be able to learn from them regularly. As for the rule you mention, I generally avoid thinking about rules if I can, even though I may actually be using them to a degree in my work. I have never seen this "rule" stated before. To me, Beauty is a combination of qualities that pleases my aesthetic, emotional, and intellectual senses. As you know, beauty rests in the eye of the beholder as well, so my own standard of beauty may not be another's. I would also agree that order can be a component of beauty if it is pleasing to us in its own right. As for complexity being part of beauty, it would depend upon the nature and degree of that complexity. Beauty can be more than skin deep -- there can be great pleasure taken in the complex as well as the simple. However if that complexity is disorderly and confusing, I would think that beauty would be seriously compromised. What do you think on the "rule": Beauty = orderness + comlexity? p.s: please visit my site. Thanks for your question, Deborah. I see no difference between the use of shadow insofar as the artistic medium goes. A shadow can be just as effective in evoking meaning or mood in either a digital image or a film based image. As for the use of shadow in popular culture, I am not sure what you mean. I love your discussion of shadow. Do you feel digital images diminish the importance of shadow in art? in popular culture? You are just playing with the ligjt Phil. I love the way you characterize shadows, Lori. That mystery you refer to is so important -- for mystery is often what stimulates the imagination itself and makes an image work as expression. Shadow gives us the other side of the coin. Wherever we have light, we usually have its fragile counterpoint, the often elusive, ever changing shadow. It takes awhile for us to train our eyes to see shadow and light in juxtaposition. So often we take them both for granted and fail to really see them for what they might mean. In that context, I would agree with your phrase "dependable companions" -- they are always there for us, if only we are thoughtful enough to both respect and appreciate their value as metaphor, abstraction, and the essence of nature. This is definitley my favorite of your galleries. Shadows are a very frequent subject of photography for me, they symbolize the mystery of life, everything that is going on below the surface while we are busy living the details of our lives. They are fragile yet dependable companions to us on our journey. Thanks, Dirk, for your musings on light. It is something we all take for granted because we see it every day. Yet it changes color and intensity throughout the day and year, and it offers us its abstracting counterpart -- shadow -- as well. As I mention in the introduction to my Landscape and Light Gallery I will often look for expressive light itself as my subject matter, and whatever it happens to illuminate is fine with me. A great joy for my eyes and as a quality light hunter since I was quite young I continue to adore and enjoy the use of fine light. Not only photographers but also painters, architects etc. are looking for fine quality light. It's amazing how less people ever thought or noticed that light can be such a joy. Maybe one of the reasons is that it costs nothing, we only have to open our eyes for it. I enjoyed for example even reading about people who were also addicted to beautiful light, like a Belgian painter who moved to another street because the light there was much finer then in the street where he lived before. Thanks a lot for sharing all this beautiful light that you captured in a great way Phil. Congratulations. You, Ruth, are also definitely an iconoclast -- a person who challenges cherished beliefs or institution. Welcome to the club! As for metering, whole books have been written on the subject, and I find most discussions of exposure control to be labored and non-productive. You well know what I think of technique for the sake of technique. However I will try to do as you asked, and explain as simply and as pragmatically as possible why we use the different metering modes. On most cameras, the default mode is some kind of "averaging" system. On your camera, a Canon Rebel, it is probably called "Evaluative," where the camera divides the image into several zones and evaluates such factors as the position of the subject, the brightness of the scene, the nature of the background, how much light is falling directly on the subject, and what light is coming from behind it. Most photographers use it when there is not a great difference in the intensity of highlights -- in other words, when the lighting is either even or back lit. The entire process is known as "averaging." In black and white photos, for example, this default "evaluative" mode would try to make all pictures look as gray as possible, because gray is half-way between black and white, and therefore average. The center weighted averaging mode also averages exposure from the entire image, but places a bit more weight on the subject matter in the center of the picture. This is a mode that is a bit more selective than "evaluative" but not as selective as "spot metering." Spot metering goes one step beyond the center weighted averaging mode. It meters on only a tiny area within a little frame in the center of my LCD monitor. I use spot metering more than other mode, because it gives me much greater control over what is going to be dark and what is going to be light in my pictures. It is my own "default" mode! I generally place the spot metering frame on the brightest spot in the picture, wherever that may be, hold the shutter button halfway down to "lock in" that reading, and then recompose the image as needed. This gives me two great advantages -- it makes sure I have no burned out highlight areas in my picture, and it also exposes the brightest parts of the picture perfectly, while making everything else darker. Spot metering simplifies my images, and make them more abstract. If Rembrandt or Vermeer were photographers, I think they would also use spot meters all the time as well, because it would give them the greatest possible control over the interplay of light and shadow. To me, a true spot meter is the most important tool in the camera, short of the focal length of the lens itself. It is the closest you can come to "painting with light." I have made many mentions of the spot meter in my captions within this gallery. Study those images to see its effect for yourself. I don't think your Canon Rebel 300 DSLR has a true spot meter in it (an unfortunate design decision by Canon) -- but you can get a similar effect by using center weighted averaging and then gradually adjusting your "exposure compensation dial" towards the "minus" side to make any highlights in the image a bit darker if need be. If you eventually should choose to buy a camera that has a true spot metering mode in it, you will be able to this a lot easier. I hope this helps, Ruth. If you have specific questions, fire away! Phil, i've been meaning to ask you this for a few days now but keep forgetting. it seems sensible to ask it here but feel free to delete and repost elsewhere. please can you explain about metering? spot, centre, multi, average...all that sort of thing. i can't get my head around it no matter how hard i try. thanks, and apologies for sending you momentarily into that technical world -- but it's a relevant part? i just learnt a new word. ICONOCLAST. i love it. Thanks, Joel, and by all means keep coming back to this gallery, as well as my others. I am always adding new images to most of them, plus frequently creating new galleries as well. New comments, and my answers to those comments, are also adding new insights to my existing images. I've been looking at your galleries for a while and I like this one the most. Thanks a lot for sharing, it's very educational. I've just added to my favourites list to remind me to come back here often. Thanks, Bruce, as always, for going to the heart of the issue. As you can see, I abhor linear thinking in my approach to photography. The opposite of literality is abstraction. I often use light and shadow as a force for abstracting, deliberately obscuring the appearance of the subject to leave room for the imagination of the viewer to enter the picture and do its work. Beauty and drama are worthy goals, but even more important is meaning, and creating powerful abstraction through light and shadow can often make pictures mean more to those who look at them. It seems that many of us have had run-ins with the literalist police, those linear thinkers who seem to believe that the sole purpose of photography is as a record of an object, and it had best be bright and sharp! Your use of light, shadow and negative space in this gallery make these images both beautiful and dramatic. Great stuff, Phil! Karen, you have made my day. I have not been called an iconoclast in awhile, and you have reaffirmed my penchant for challenging conventional wisdom. Shadows can indeed make photographs work more profoundly by leaving room for the viewer's imagination to enter a picture and fill in its own details. You are right -- there are many photographers avoid abstraction and prefer a more descriptive, literal approach. To them, shadows, (as well as blur, soft focus, and bold cropping) are often threatening, because they leave so much open to the imagination of the viewer. On the other hand, photographers who value expression over description will sculpt light and its counterpart, shadow, to define meaning. I like the iconclastic viewpoint of this gallery given the current trends in digital photography. (Note all the tutorials and filters for removing shadow.) And here you show us that shadow MAKES the photo. Elizabeth -- I thank you for your comment, and I hope that all of my galleries will eventually be of some help to you. That's why I posted them on pbase -- to help beginners such as yourself learn the fundamentals of expressive photography. Your work is stunning. The photos in this gallary are among the most beautiful I've ever seen. You are such an inspiration for any photographer but especially a beginner like me. Thanks for sharing your work. Matt -- using light to enhance the meaning of our pictures is all about contrast. The more emphatic those contrasts, the more our images will say. Thanks for your kind words on my gallery. Beautiful contrasts. Your photos show real talent, very impressive. Thanks, Bart. You are on mine, as well. Love your work, Phil! Welcome to 'my favorites' list. BZ -- I can't take credit for the golden light -- I only try to make the best use of whatever light I'm given. But I do try to do all I can to organize my time so that I can "be there' when the "golden hours" roll around. Thanks for the golden light!!! Phil, your words are full of wisdom which comes from your decades of years' experiences. This gallery recalls the memories that i ran with my heavy backpack and camera in the fields, villages and remote mountains only to capture a moment for its light and shadow. Each photo of yours is an art and has its own story. Thanks. Are you ever going to stop traveling??? :))) Fantastic pictures!